At one time the customer was king. So says Tom Murphy, technology journalist, in his new book Web Rules, which examines the seismic shift of power and its effect on not only businesses but also the media. The Internet, according to Murphy, has empowered everyone with access to all sorts of information they need to make better decisions and influence decisions made by others. Emerging e-commerce is changing the way consumers shop. Murphy shows how entrepreneurial sites like Amazon.com have emerged as models for Internet companies. "Corporate warfare is imminent in cyberspace," says Murphy. "Huge fortunes are being spent. Strategies being drawn." But commerce isn't the only thing the Internet is changing. A seas of change is washing over the media, from traditional news to avant garde sources. Even politics is changing. Murphy believes in the old adage, "What goes around comes around." 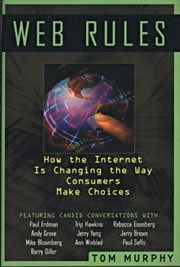 As large retailers replace mom and pop shops, consumers will turn to the Internet for individual, personalized service. Murphy's book shows how the Internet is fast becoming a virtual mall, complete with large anchor sites and thousands of small boutique sites offering consumers specialized products at reduced prices. "For a population that couldn't program a VCR clock, the technical obstacles to using Netscape's E-mail was comparable to learning Russian without a tutor." Murphy fills his book with pithy statements like this. He discusses real-time media beginning when Samuel Morse sent his first telegraph messages, through radio, and into television and finally the Internet showing how each has affected consumers. This informative book is a must read in today's Information Age.